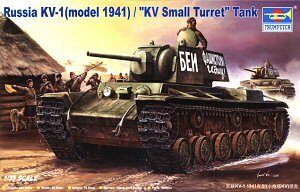 Trumpeter have followed their excellent kit of the “Emil” (kit #00350) with the first in the KV series with this model of the KV-1 model 1941, which is actually a KV-1 Model 1940 which was armed with the F-32 76.2mm main gun in a welded turret and featuring the initial rubber lined resilient road wheels with the model most likely depicting a KV-1 produced at the Kirovskiy Plant in Leningrad. The kit consists of 290 parts in light grey plastic with 2 in clear plastic, a length of copper wire for the tow cables plus the decal and instruction sheets and offers a number of alternate parts allowing slight variations in finish. The quality of the mouldings is excellent and on a par with the recent ‘Emil’ kit with clean crisp details and a minimum of pin parks with those present being very shallow for easy removal. The kit as mentioned offers a few a optional parts that require the locating holes to be opened up in the hull and engine deck parts before assembly so check the instructions and decide if you will use the optional parts and open up the holes accordingly. The lower hull has a traditional tub with bottom, sides and front panel to which is added the separate outer side and rear panels, this allows different side details to be incorporated without replacing the whole tub, quite nifty. The fit of the side panels to the hull is excellent and once attached form a trough at the top for fitting the upper hull panels. The side panels have the axle and final drive locating plates included with all other details such as axle bump stops, return rollers and final drive mounts added as well as the separate axles. These have hexagonal locating stubs that fit into corresponding hexagonal holes in the hull sides ensuring they are positioned at the correct angle and have nice details on the axle hubs. The resilient road wheels are made up of four parts each with the inner and outer wheel having a separate central hub to ensure good detail definition and the wheels look good when compared to reference photos. The drive sprockets have bolt head and other details on both sides of the inner and outer disc as well as having the central hub disc as two separate parts with the correct number of retaining bolts for this version. The idler wheel mount has a three part tensioning arm for good definition while the idler wheel has the two wheel discs with excellent rib details and the two part return rollers are also the correct type for this model KV with well defined details and finally there is a the drive sprocket clearing device fitted to the rear hull sides. At either end are separate towing attachments and shackles, these have sizable mould seams but should be easy enough to clean up. You are given a choice of full length vinyl tracks or pre-formed sections of plastic link and length track to use depending on your choice with the vinyl track having excellent details on both sides and looks very good for this type of track and is also very flexible to help with track sag. The plastic track incorporates pre-formed track sag along the top run and another long section for the ground run and individual links for around the drive and idler wheels. The details on the plastic track are again excellent but there are some shallow pin ejector marks on the inside to be removed which shouldn’t be a problem. Just a quick note here if you prefer fully workable tracks, check the KV Resource Page for the various track sets now available for the Trumpeter KV kits. The upper hull panels are in two sections with the forward section including the turret race forward to the glacis and the rear engine deck; this allows easy replacement of the engine deck for other versions without replacing the whole upper deck. The fit of these panels to the lower tub is excellent with any minor edge gaps small enough to be filled with glue as you attach the panels. Added to the top panel is a separate turret ring which allows more details to be included than if the ring was moulded with the hull top, but unfortunately there is a series of pin ejector marks around the ring that will have to be filled. At the front is a separate nose cap with subtle rivet details. There are subtle weld seams on the forward hull section and excellent bolt head and panels details on the engine deck as well as inner vanes under the two side intake grills. These side intake grills are interesting in that they are moulded solid with nice mesh details as well as offering a choice of grills, one with rounded end profiles and other with one flat end profile (see images) and you should check references to see which applies to particular vehicles. Being moulded solid these grills obviously hide the inner vanes but there will no doubt be after market etched screens produced and already having the inner vanes is nice forward thinking by Trumpeter. The front crew hatch has a separate hatch lip and the hatch has interior latch details as well as a small hinge to allow the hatch to be positioned open if required. On the driver’s plate is a separate visor cover, horn with separate wiring ducting, the head light with separate clear lens and three part machine gun mounting as well as separate periscope cover on the hull top all with well defined details. The engine deck has separate round inspection hatches again with interior latch details and hinge as well as a separate central domed engine access hatch with has an optional centre fitting (you have to open up the locating hole to add this if required). Also added to the engine deck are eight very small lifting eyes that will need careful removal from the sprue and in gluing, with tweezers being the order of the day. At the rear are three additional panels that make up the engine louvers under the curved rear hull panel and the exhaust outlets are also separate parts with the fit of the centre panel and all parts are excellent with out any trimming needed. Additional alternate parts provided are the added armour plates sometimes fitted to the forward hull sides above the fenders and you have to open up locating holes in the hull sides for these early on although they can easily be fitted later if you forget to open the holes. These are full length either side with very nice surface details of rivet heads and securing strips as well as a nice outer lip and also include the longitudinal centre stiffening bar on the undersides. You have to open up a few locating holes for the fender storage boxes and other fittings applicable to this version before assembly, so check the instructions carefully and there are some shallow pin marks on the underside that are easy to remove. One thing of note here is the forward side panel between the fender and glacis which is included with the main fenders and moulded using slide moulds resulting in well defined details on this panel. The fender supports are all separate parts for good definition with the fit of the fenders to the hull being very good and again any minor gaps will be filled with the glue residue as they are attached. It should also be noted that the fenders in the two later kits with steel road wheels (00358 and 00359) are 1.5mm narrower than the fenders in the earlier kits with resilient road wheels (00312 and 00356). There is the main turret shell and lower turret ring section with the join between the two being spot on without any gaps to fill. The details on the turret include nice weld seams and rivet details and top ventilator with all other parts separate. On the top is the early style forward sighting periscopes and side and rear facing periscope covers with nice retaining bolt details as well as two very fine grab handles. The top hatch again has internal latch details and separate hinge allowing this to be shown open but there are no interior details to show. The forward gun mount has the two rounded outer sections that trap the internal mount for the mantlet which allows this to elevate with these fitting snugly to the front of the turret with a separate top cover panel. You are given two alternate mantlets and F-32 gun tubes with the earliest and later designs and you should check references to determine which is applicable to the model you are building. The barrels are moulded in one piece with the muzzle hollowed out using slide moulds although there is a minor moulding seam to be removed. 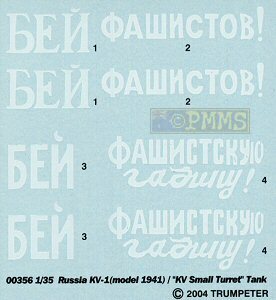 The decals are nicely printed in white with thin carrier film cropped close to the printed image and give you turret slogans for two KV-1s finished in overall Russian Green but no unit information is given for the particular vehicles. A full colour sheet is included showing the two vehicles and can be used a painting guide as well as showing the decal placement. Trumpeter has really done their homework on this kit with well defined details and alternate parts for the subtle differences in vehicle features. 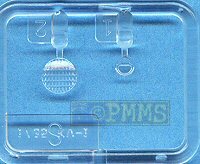 Other choices such as the alternate tracks and mantlets add to the appeal of the kit which is a quantum leap ahead of the ancient Tamiya kits and more recent Eastern Express offerings. It is sure to be welcomed by allied modellers as well as anyone wanting a fairly simple yet well detailed kit to build straight from the box. See the KV Subject Listing for full listings of updates/accessory and other KV reviews on site. Kit courtesy of my Credit Card and the excellent service from Rainbow Ten.